of newly formed Czechoslovak Air Force. 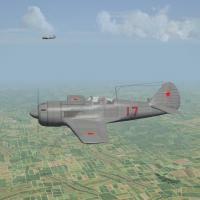 Czechoslovakia became the sole operator of the La-5FN outside the Soviet union. In the CAF the La-5FN were designated S-95 (S for Stihacka - Fighter). These aircraft remained in use after the type had been withdrawn from Soviet union. - take La-5FN-R2.lod from A-TEAM "StrikeFighters2 WW2Finland" install and put inside "La-5FN". I'm going to upload a serie of A-TEAM/CAPUN great WWII planes post war remodded. I'ld wish again that CA and A-TEAM great sites and people could find a way to be a whole great community, because togheter we will be all richer and stronger. So don't post anything against anyone here, please. Let's make mods and not mod-wars! La-9 entered production in August 1946. A total of 1,559 aircraft were built by the end of production in 1948. La-11 entered production in 1947. By the end of production in 1951, a total of 1,182 aircraft were built. They were two piston engined aircraft produced at the start of the jet age. Note: although NOT strictly a WW2 aircraft, but immeadite Post-War. This'll give the Mustangs, Spitfires and such something to else to tangle with in the late 1940s. 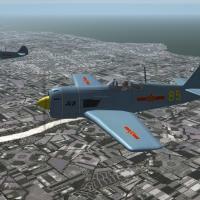 Some modifications, tweeks, and various fiddles with Bunyap's Lavochkin La-11 "Fang", bring it into SF2. This is the complete package, with cockpit, skins/decals, and engine sound. The decals inis have been rewritten to use as many stock decals as possible. The NK Green, however, has new decals made for the KAW mod with semi-historical numbering. New hangar and loading screens are included, now in jpg format. The hangar screen is an SF2-style rebuild of my original 'box art' version. It should be noted, that due to the age of model (ie: it's from 2005!!) there are many issues that are unfixable. One of the major ones, is the shadows are turned OFF, as there are huge 'tractor beam lines' extending from the aircraft. You just have to live with them. 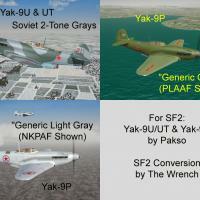 MOdifications, tweeks, FM enhancements, and so forth to Pakso's Yak-9 WW2/Korean Era/Early Cold War Soviet & satellite countries fighter. 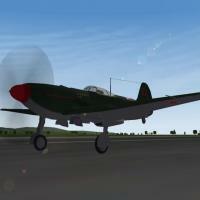 All aircraft have new, enhanced FMs for SF2. While pretty close, there is probably some room for improvement - this is !ENCOURAGED! for those with the skills and time to accomplish. All aircraft have completely NEW skins, created from a Home-Grown Templates (patent pending), and how have the correct color schemes, as well as corrected/new panel and rivet lines for the variant (9U/UT is different from 9P). All national marking and 'Bort' numbers are stock, in-game decals. Userlists are incuded for all three. All guns and weapons, excepting bombs which are stock, are provided in this pak, as well as Pasko's pilot figure. As expected, the canopy opens/closes via manual animation keystroke -the (in)famous Shift/0. A new in-line V-12 sound, from many of the WW2 mods, is included. A quick note on guns: the nose cannon on ALL variants has been set as "Fire_Secondary_Gun", so make sure you have a seperate button mapped for it's use. As always, fairly easy to follow, detailed install instructions are included. So, please read them. Also, give the "Notes" section a read for further information and stuff like that there. For historical purposes, Pasko's original readme is included. in Moscow-Khimki and, after evacuation in 1941, at TAPO in Tashkent. The project was directed by aeronautical engineer Boris Pavlovich Lisunov. 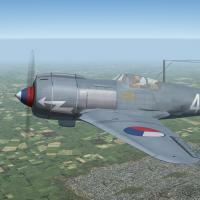 This is the post war turretless model rebuilt by me from the stock C-47A. All in main mod folder and overwrite. Sweden, as in Mid East, Korea and in Taiwan, too.